attended Port Townsend schools and my granddaughter does, too. Whatever we can do to make today's education relevant and inspiring—I want to make that happen!" 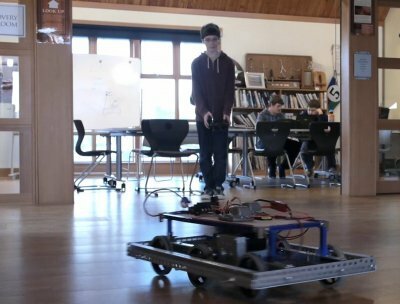 When students are routinely using their knowledge for hands-on projects in their community, “When will I ever need to know this?” is no longer a relevant question. Imagine a day at school that starts with a math class calculating a navigation plan. 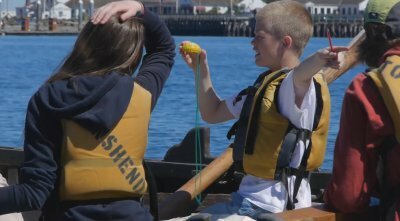 Instead of another day of dodge ball, what if students learned to row or sail or swim or right an overturned life raft? A science lesson involving a shellfish count on the beach coupled with a civics lesson analyzing the policies of ocean acidification? This is place-based learning through a maritime framework, and these experiences are connecting students with land and sea over the course of their careers. Through national level research and firsthand experience, we know that place-based learning is powerful and effective. The Maritime Discovery Schools initiative is creating a cohesive framework for compelling experiential and project-based learning throughout a student’s academic career—not limiting education to those maritime experiences but using it as a common thread to connect learning across grade levels and subjects. This is both a radical approach and one with well documented results. There are numerous examples of schools organized around a theme (the New York Harbor School in Brooklyn, Aviation High School in Seattle, and San Diego's High Tech High to name a few). Our changes depend on the involvement of community partners to enrich learning, and what makes us different is the alignment of our entire district. We aren't talking about a vocational track, but some students will naturally be interested in exploring in-depth the experiences that could lead to maritime careers. For those students there will be an opt-in high school Maritime Academy available in 11th and 12th grades that will be a “school within a school” and will immerse students into the maritime world. There is a direct correlation between a student's education and the health of a community. Learning is powerful when it is relevant and applicable. Hands-on craftsmanship is a complement to intellect. Our natural setting is unique, and offers incredible opportunity for learning.